chrose1201, pteropid and Rtowell73 like this. Wait... I thought Jem Jr's only had half of a vine? For anyone looking to do a similar project, Gotoh SG381-07 L6s, Ge1996t, GHL-2, EPR-2s, Dimarzio Evo bridge, ISCV2 single coil, and Evo neck, Got the pearloid truss rod cover and pickguard from ebay and gold screws from stewmac. It all dropped right in with no modifications required. 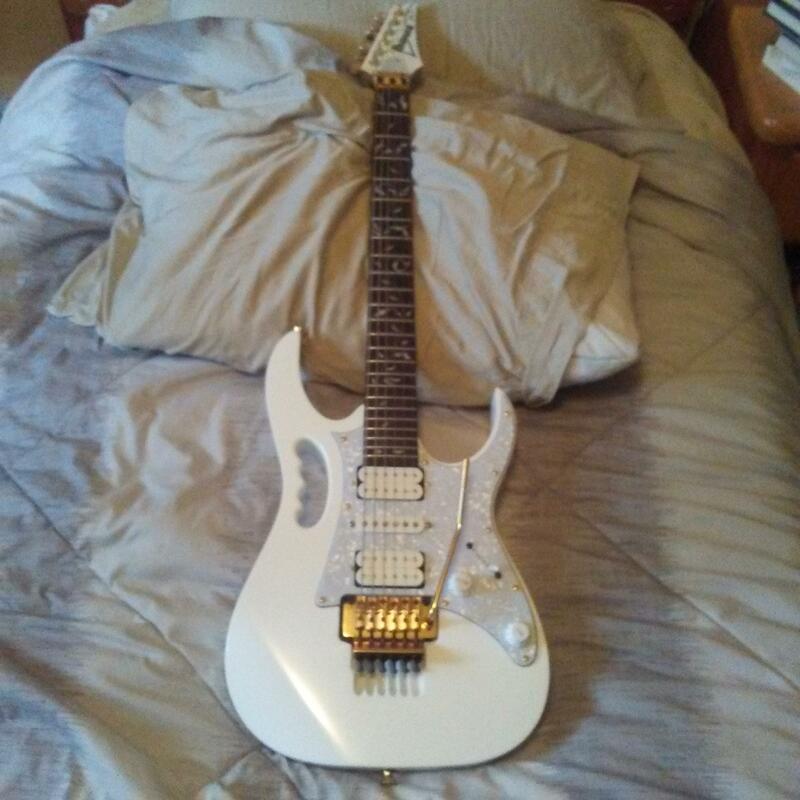 "For anyone looking to do a similar project, Gotoh SG381-07 L6s, Ge1996t, GHL-2, EPR-2s, Dimarzio Evo bridge, ISCV2 single coil, and Evo neck, Got the pearloid truss rod cover and pickguard from ebay and gold screws from stewmac. It all dropped right in with no modifications required." That looks beautiful!!! Just ordered teh Jr ... should get it Friday. Want to do some of the same stuff to it. The biggest wall I'm running into if finding the pickguard, rod cover and back plates in the pearloid white. So many and not sure what/which is legit. Any help would be appreciated. "I'm assuming the first item there is the tuners, but I have no idea what the next three items on your list are..."
The Ge1996t(gotoh) is a tremolo. Great job. I did a similar one but with Graph-Tech Tuners, Original Lo-Pro EDGE with EDGE locking Posts and studs and the customary EVOs. Looking for a pearloid pickguard - where did you find that? Can you link one here? Thanks! DITTO on the pick guard... I've gone through two... pick guard, tremolo cover plate, and jack cover plate. Sites say they fit... but when I get em... they don't. AND they're from Singapore and such and cost 2 - 3 times what I paid for em to ship back. I'm just about ready to live with the plain boring white plate and pick guard. Wondering if it's like another model (RG350 or something) that might fit. waiting for OP to respond. Got a truss rod cover from another place. Just got the one that looked like it had similar screw holes. I think I'm gonna leave my hardware in Cosmo black or perhaps Black, like Steve's Evo. Like that look better. GearBoxTy and pteropid like this. I am planning to get a real JEM as well but this seems to be a good platform to perform custom upgrades. Thanks.